Ok, it's Springtime... Feeling overwhelmed? I know, everywhere you look there's something to do in the garden. Yikes! Spring in the garden is a joyous time, but hectic too. I've discovered a few simple tricks that reduces my stress, so that I can enjoy my Spring garden... without the guilt. Walk around your garden in the morning with a cup of coffee (for me it's tea) and just look around. Right now, you'll see new foliage emerging and you'll remember, oh yeah I have that coming up. I know, sometimes it's difficult to imagine what you liked and did not like the previous year. I always think I'll remember, but then I don't. So, what I like to do is start a list of 'likes and dislikes' and 'to-dos' that I add to, throughout the growing season - Garden Notes. This helps me a great deal and reduces my stress. 1. Start with your front. If your front looks neat and tidy, this will make you feel more relaxed and give you a feeling of accomplishment - and beautiful Spring curb appeal! 2. Put on some music! Music in the Garden energizes me and makes my garden chores more fun, and keeps me moving along. 3. Concentrate on a few activities and complete them. This is a smarter strategy than trying to be everywhere and not succeeding anywhere. 4. Work berm by berm. Cut down grasses and evergreen ferns, prune summer blooming trees and shrubs. Be on the lookout for dead and diseased wood in trees and shrubs and prune them out. Give your lawn a good start - aerate, thatch and fertilize. And, don't forget to bait for slugs. I like to use organic Sluggo Plus. 5. Weed whenever you see a weed! If there's one thing that you have to stay on top of, in our maritime northwest gardens, it's weeds. I especially do this method in my front and back. On the side of the house, where I store my extra plant material, I'll weed all at once every few weeks. 6. Feed your plants with an organic mulch. Mulching enriches your soil and feeds your plants, helps retain moisture, and keeps weeds down. The best time to mulch is late Winter or Spring. The only time you don't want to mulch is in the heat of summer. Once I get the mulching done, I feel more relaxed, because I know my plants are getting a healthy start on the season. If you'd like to know where I buy my mulch in the greater Portland, Oregon area, drop me a comment in the comment box below. 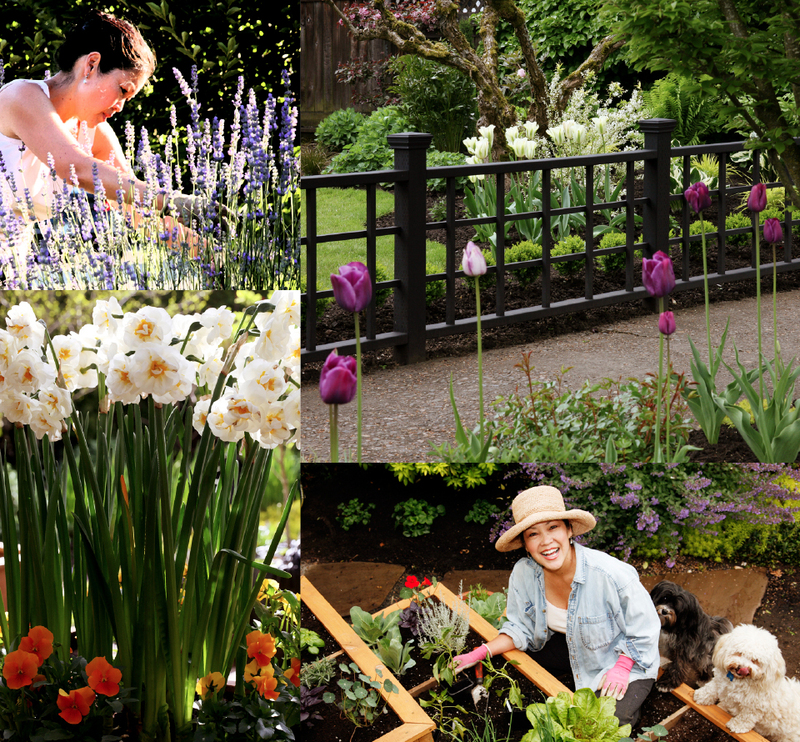 Finally, after a busy work day in the garden, take the time to luxuriate in your garden. I love 'walking my garden' with a glass of wine and enjoying the beauty - the fruits of my labor! Emerging hostas, grasses, and hydrangeas. Enjoy your Spring garden, and don't forget to start your 'Garden Notes'. If you have any questions, don't hesitate to drop me a line in the comment box below - always love hearing from you! Need a picker-upper when you're dragging through your Spring garden to-dos? My childhood was filled with sounds of rhythm & blues and rock & roll - Stevie, Supremes, Temps, Beatles, Beach Boys. When I was about 8 years old, my mom promised me a new bathing suit if I learned how to dance; she wanted me to be well-rounded (not in the bathing suit...:) I got that new pink, one-shoulder bathing suit...:) To this day I still love to dance. For my recent birthday, my sister Leilani bought me a portable wireless Bose sound system. I am in love with it! So, now I have this cute little portable wireless music box that sounds great! I'll save the big amps for the big parties. The Bose connects to my i-Tunes off my computer, and voila I have beautiful music, 'blowin' in the wind'. 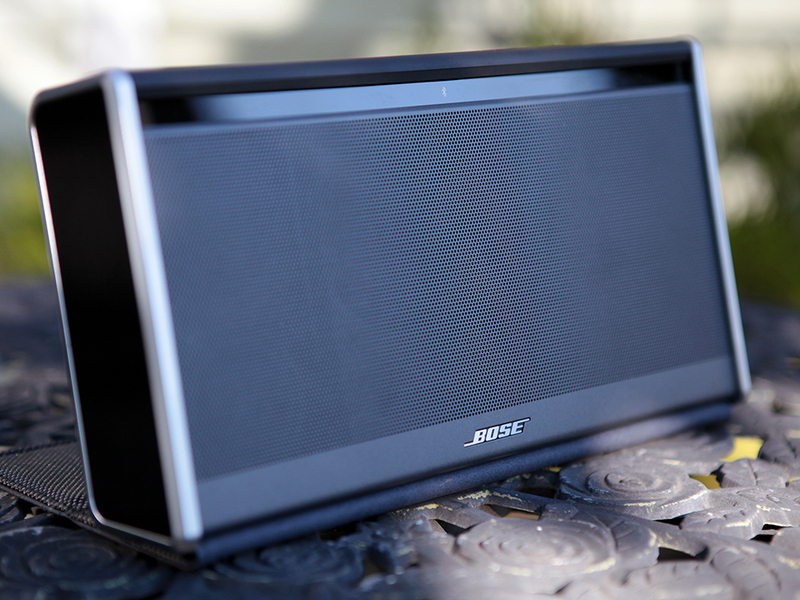 I highly recommend a Bose sound system; there's one for every budget...:) If you wanna know where to buy, click on the rectangle icon below and shoot me a comment. I listen to all genres of music, but one of my favs for gardening is Bossa Nova - Antonio Carlos Jobim, Sergio Mendez & Brasil 66. Latin music really gets me going. Fred will often catch me dancing to the next garden task...:) You know in Portland on Saturday mornings at 9, KMHD Radio features an hour of Latin music. I try not to miss it. Check out the music video below, and check out the earrings; I thought I liked big earrings...:) The tall girl reminds me of you, Jessica. Does anyone know what "Mas Que Nada" means? Click the rectangle icon and shoot me a comment. Enjoy your Music in the Garden... and as always love hearing from you! If you have any questions, don't hesitate to drop me a line in the comment box below. One of the rarest of the Helleborus niger, derived from a cross of Helleborus niger and Helleborus lividus. Early blooming pink buds open to outward facing creamy white blooms, brushed with shades of rose and cinnamon. Very dark green foliage, strong stems. What would a garden be without hellebores? *sigh*...sad. Hellebores are blooming now, late winter. At a time when color in the garden is sparse, hellebores are pure delight. Mine are looking gorgeous! The "petals," single or double, are actually sepals and shelter the true tiny flowers nestled in the center of the blossom surrounded by yellow stamens. The petal-like sepals, either nodding or outward facing, range in color from deep plum, rose, apricot, mauve, soft yellow, chartreuse, white, and are often spotted with purple. Their large, handsome leathery, palmate, serrate, foliage contrasts nicely with finer foliage plant material. I love grouping and planting them with ferns, hostas and other shade-loving plants; perfect in a woodland garden. One of my favorites and another early bloomer. Outward facing pink blooms mature to a deep cranberry. Dark green, slightly marbled foliage with dark burgundy stems...striking! 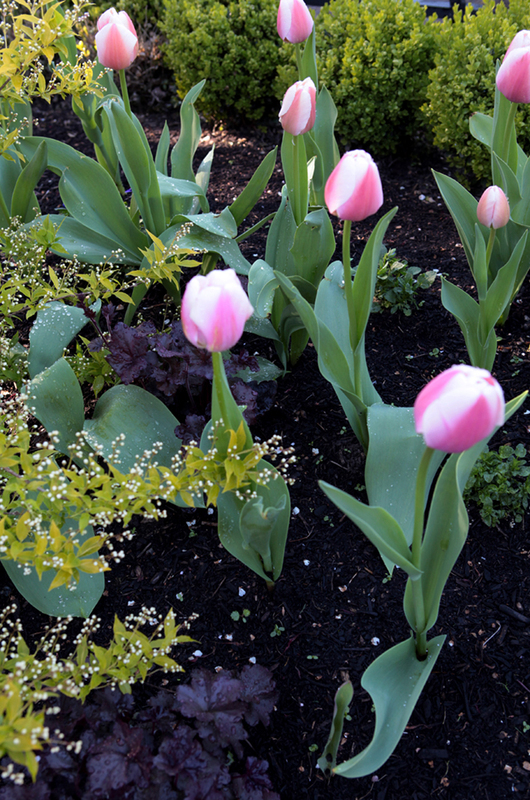 Wonderful when planted with early or mid-spring blooming powder pink tulips! If you've never tried growing hellebores, I highly recommend them. 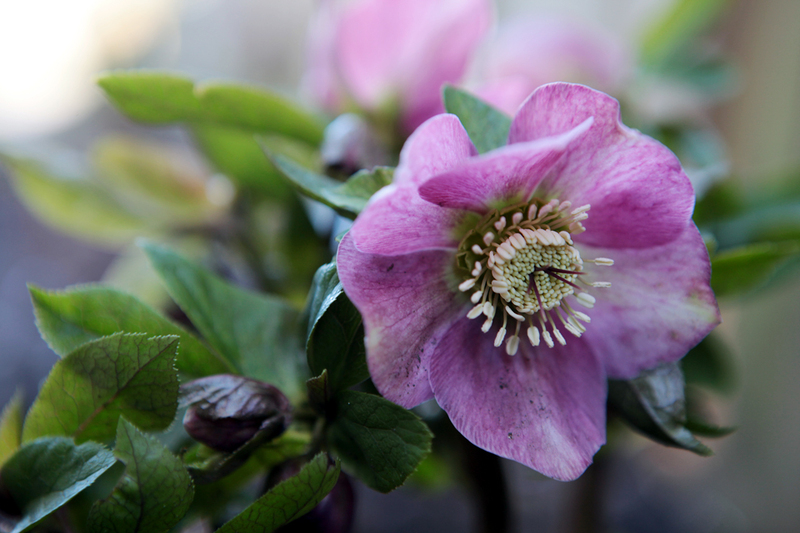 I grow a few varieties, Helleborus orientalis, more commonly known as Lenten Rose and Helleborus niger, more commonly know as the Christmas Rose; neither are roses, but are actually in the Buttercup family. They are super easy to grow and need little care. They love moist, but not wet, rich organic, neutral to alkaline soil, and are greedy feeders; I like to use a time release fertilizer like Osmocote or a balanced organic fertilizer in early spring. Plant in an area that receives winter sun, but later shaded by deciduous trees and shrubs. Although evergreen, in the winter the foliage will often look tattered, so I'll prune back the dead and disfigured foliage before the new growth appears. Enjoy, and as always love hearing from you! What to do on a snowy cold day? 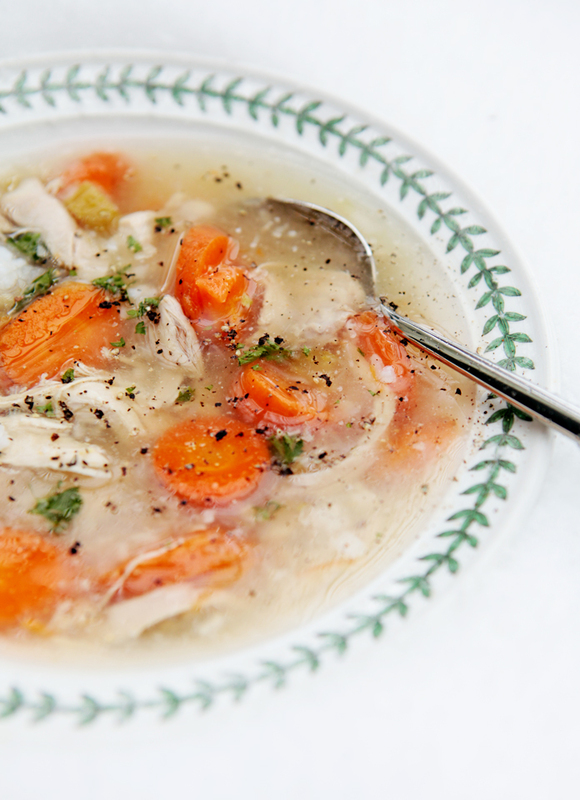 Yesterday, I made a batch of my Super Simple Chicken Soup that was especially tasty. Not exactly sure why, cuz I always use organic chicken and onions, but sometimes I'll use carrots that I already have in the frig that I want to use up. You know, the already peeled and cut carrots in a bag. But, this time I used fresh organic carrots and I never peel; I think this is what made the difference. The broth was distinctly sweeter, and as always simple, nutritious, and delicious! Parsley for garnish. I buy all organic. 1. Bring chicken, water, and 1 tablespoon salt to a boil in a large stock pot. Skim foam. Add onions, celery, and garlic. Reduce heat. Simmer, partially covered for 30 minutes. 2. Remove breast, and set aside. Add carrots. Simmer, partially covered for 40 minutes. 3. Remove remaining chicken; discard back and wings. Remove meat from bones, and cut into bite-sized pieces. 4. Stir in desired amount of chicken. I use either one whole breast or one half breast and two thighs. The rest of the chicken, I'll use for chicken salad the next day. Enjoy, and as always love hearing from you! If you have any questions, don't hesitate to drop me a line in the comment box below. I hope you had a joyous holiday season and were able to have some relaxing time too. Fred and I decided to stay at home by ourselves, rather than be in a car on Christmas day for 5 hours. We missed family, but it was sooo relaxing. We burned a fire all day, read, watched a movie, took a long walk, played with our furry loved ones...:) And, most important we didn't feel guilty for not working in our home office... nice! Last night, I decided after too many holiday treats and nacho nights watching the college football bowl games, Fred and I needed to get back on track eating healthier... So, for dinner, I made Cynthia's Lemony Caesar Salad with grilled salmon on the side. Cynthia's Lemony Caesar Salad is simple and delicious! I recently reconnected with my longtime friend Cynthia C., when she hired The White Pear to design and install a garden pathway along the side of her house. Back in the 90's, Cynthia and I were waitresses together at the Brasserie Montmartre - crazy time! So, while I was overseeing the pathway installation, Cynthia was getting ready to go to a pot-luck dinner and was making her recipe for Lemony Caesar Salad. The dressing was delicious and I liked the way the salad was easy to transport all in one bowl: dressing, romaine lettuce (pre-washed), croutons, parmesan, lemon. When she arrives at the party, she can easily assemble the salad and everything is fresh. • 1/3 cup Grated Parmesan Cheese; reserve a little for tossing with the salad. Mix all ingredients in a food processor or blender. Chill. 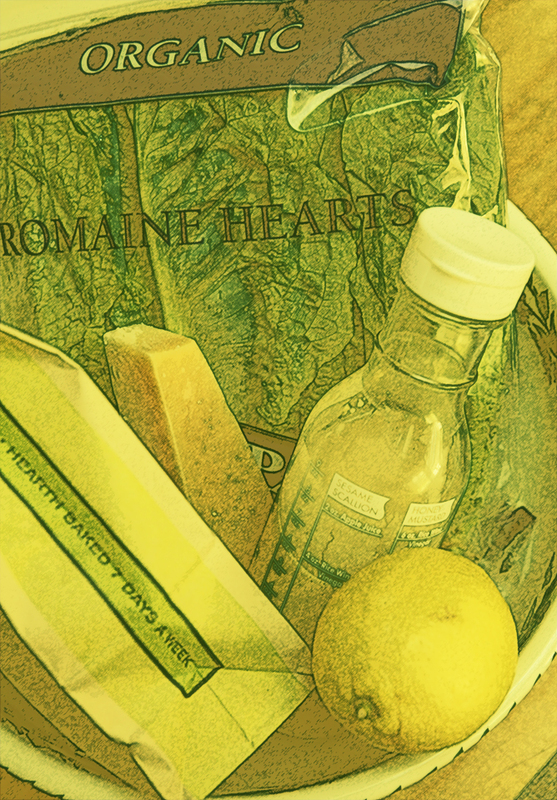 Hearts of 3 Organic Romaine Lettuces. Tear into bite size pieces and chill at least 15 minutes. Squeeze the juice of the other Lemon half over the lettuce. Add Dressing, Artisan Croutons, and reserved Parmesan Cheese and toss. For more of a meal, add grilled salmon, shrimp, or chicken on the side. Enjoy and as always love hearing from you. Burlap wrapped pot to protect from freezing weather. This year we had a cold Fall in the Pacific Northwest, so I moved some of my pots against the foundation of the house to protect from wind; other pots that I couldn't move easily, I wrapped with burlap. The burlap will help protect the pot from freezing and thawing and cracking. It doesn't look too bad because burlap is a natural fiber and seems to blend with its natural surroundings...:) When freezing weather is not threatening, it is super easy to unwrap and wrap again if needed. I hope everyone is having a wonderful holiday season. It is hard to believe another year is just about finished... makes me a bit melancholy. Wintertime does give me a respite from working in the garden, so as I try and stay warm and cozy by the fire, I will dream of Spring in the garden and all its beauty and color. Enjoy, and as always love hearing from you! Canna Tropicana - Dramatic Deep Red/Black Foliage! It is now Fall here in the Pacific Northwest (zones 7-8), and care must be taken to overwinter cannas. There are a couple of ways to do this; either lift the rhizomes and store, or protect from frost and rot while still in the ground. I have been successful with both methods, although when I've left them in the ground with a protective covering of mulch, I tend to lose one or two each time to rot; my soil tends to be heavy, even though I compost twice a year. I think the cannas also take a bit longer to sprout when left in the ground. But, this year, I'm going to use both methods. Some varieties I'm going to cover with an organic mulch and take my chances on losing some rhizomes; other varieties I'm going to lift and store. When the weather warms, I'm going to mix a couple of canna varieties together and relocate to different areas of my garden. I love a new garden surprise every season! After frost has killed back the foliage, dig up the entire root mass and leave as much soil around the roots as possible. The soil should be moist, but not wet. If too wet, let air out, but not totally dry out. Put the whole clump inside a large plastic bag. Cover any bare roots or rhizomes with damp peat moss, tucking in here and there. Close the bag up loosely and store in a cool, dark, frost-free place, temperature ideally between 45-55 degrees with humidity around 75-90 percent. In the spring, when the clumps start to sprout and when the weather is frost free, this is your sign to plant. Use a sharp knife to cut apart individual rhizomes, each containing a good bit of rootstock and one eye (growing point). Loosen your garden soil to a depth of approximately 12-15 inches and amend with a layer of compost approximately 2-4 inches deep. Dig a 2-3 inch hole and place a single rhizome horizontally in the hole with the eye facing up. Cover the holes and rhizomes with soil. Press the soil down firmly and water. Add a layer of mulch over the flowerbed to help retain moisture. Throughout the growing season, keep your cannas well watered, and they love at least 5 hours of sunlight. For optimum blooming, feed with a fertilizer rich in nitrogen about once a month, and don't forget to protect from slugs with an organic slug bait. I like to use Sluggo Plus. I'm also diligent in picking off the dead flower petals; I hate the dead brown look...:) After each flower head has finished blooming, cut the stalk to the next leaf structure and your canna will rebloom! Fresh and beautiful cannas all season long... Enjoy, and as always love hearing from you! What better way to delight the senses during the drab months of Winter, than an Indoor Blooming Bulb Garden! If you love to garden, and feel deprived during the colder weather, 'forcing' bulbs is a fun way to bring color and beauty indoors. Forcing is the term used to describe the process that stimulates bulbs to bloom out of season. This is a fun project to do with your kids too! When you buy your bulbs, be picky! Avoid any bulbs with soft, diseased, or insect damaged areas. Tulips should have their skins intact (also called tunics) or they'll be vulnerable to disease. 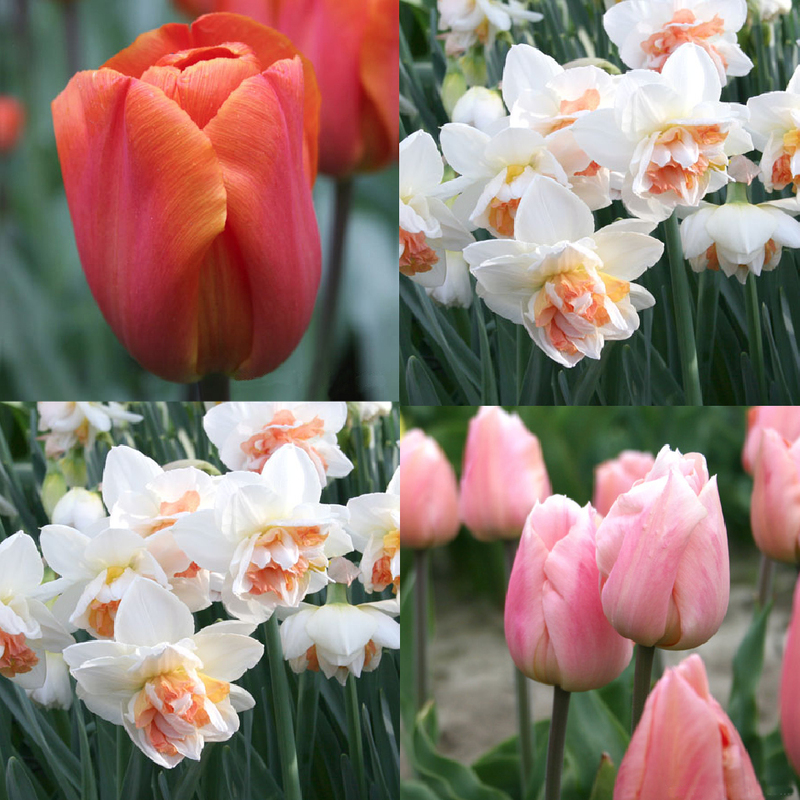 Here are the bulbs that I've chosen for this design, from left to right, top to bottom. I used the same variety of daffodil twice; I liked the repetition. Fill the pots with soil; leave 1/2" of space below the rim to allow for watering. Plant one type of bulb per pot. I like to use 3-5 bulbs per pot, depending upon their size. Place the bulbs about a finger width apart and make sure you allow a minimum of 1 inch of soil beneath the bulb; actually, tulips and hyacinths can have their tips poking through the surface and they'll be just fine. No fertilizing! Bulbs contain enough food in them for developing their roots and flowers, so don't fertilize during the forcing process. The bulbs need approximately 14 weeks of chilling time. There are a few ways to chill the bulbs and all work great. If you have a second fridge you can store the pots in the refrigerator, but make sure you do not store with apples. Apples produce ethylene gas which can inhibit flower development. A cool corner of a basement or garage works great too, as long as the temperature remains between 35 to 45° F (2-4° C), and there is very little light. And, you can also use a cold frame or greenhouse in a shady location. Keep in mind, bulbs in pots are very vulnerable to cold damage, so if you live in a region that gets severe winters, pots in a cold frame or unheated greenhouse may freeze solid. Check frequently to see if the bulbs need water. Don't let the soil dry out completely, but you also don't want them soggy, as they will rot. After about 10 weeks, begin checking to see if any pots are ready to bring indoors. As a rule of thumb, they are ready when new shoots start popping up. Bring the pots inside and place them in an area that receives indirect light. Once the shoots start to green up and grow, you're ready to place the pots in your decorative container; hide the pot rims with sheet moss, and move to a sunny location and away from a heat source. Water regularly to keep the soil moist, but not wet. It will take approximately 3 weeks for the flowers to appear. Enjoy your Indoor Blooming Bulb Garden, and as always love hearing from you! Fall & Football & Baseball Too! So, Saturday, I watched my favs, the Ducks and Bruins win, and eyeing the Beavers win too. Sunday, I watched my Seahawks play the Titans, and since they had lost last week, I was relieved and happy they won this week. I was ecstatic watching the Red Sox's come from behind win against the Tigers; not that I'm a Red Sox fan, but what great baseball! Now, if only the Dodgers could win their game tonight, not only cuz I'm a fan, but it would make the series a lot more interesting…:) They're down 2 games to the Cardinals. I'm watching as I write this post - 2-0 Dodgers! I know what you're thinking… did she get any gardening done? Oh, yes I did… I started in the mornings before the games were on, ran out at half times, and finished up after the games. I deadheaded perennials, swept leaves off the driveway and parking strip gutter, did a little light shaping of evergreens, a little weeding, cut back flopping grasses, mowed, edged - all small garden activities; glorious on a sunny Fall day! Don't stress yourself out by doing your Fall clean-up all at once; small doses in the fresh air is much more enjoyable and healthy. And, my most fun project this weekend - designing two "Indoor Flowering Bulb Gardens"; sure to brighten your late Winter months. Stay tuned next week, where I'll share my designs with you. If you're receiving my posts, want to follow my goings on, and haven't signed up yet, you can do so by clicking on 'subscribe' and filling out your name and email address. A couple of weeks ago Fred and I were in Eugene, Oregon for Fred's niece's wedding and brother Scott and his family flew in from New York for the big day. Cooking morning breakfast together is family time. I asked brother Scott, "How do you know when your pan is pre-heated?" He started to give me a lesson on how he cooks scrambled eggs, so I yelled at Fred "grab the camera; this might be good for the blog." I did think for a second about being in my pj's, no make-up, etc., but who cares; they say to be yourself on the internet...:) We had a blast doing it, mistakes and all. Watch until the credits for the "kicker." Scott graduated from the U of O; you'll get it… Enjoy!